UKIP Leader Nigel Farage has accused some pollsters of "voodoo science" and said there had been attempts to "talk UKIP down" in the last month. "We are actually going up in the polls," he told the BBC. He dubbed the prime minister "Desperate Dave" for asking Conservative voters to "come home" and said he had only promised a referendum "half-heartedly". Without UKIP MPs holding his "feet to the fire" any in/out EU referendum may not be "full, free and fair", he said. Mr Cameron has pledged to renegotiate a "better deal" for the UK in Europe and hold a referendum by the end of 2017. Labour and the Lib Dems have opposed a referendum unless there are plans for a transfer of more powers to the EU. Asked why his raw polling numbers had changed little in the last six months, Mr Farage told BBC One's Andrew Marr Show: "There's been a very desperate attempt to talk UKIP down over the last month - every commentator, every pollster - and one or two of the pollsters are using voodoo science to try to produce quite low numbers. He added that the current first-past-the-post voting system was "bankrupt" and a vote for his party was a vote for change - both in the country's direction, and the voting system. Mr Farage said that he wanted there to be more focus on the "big issues" in the election, rather than focusing on possible coalition deals - as he put it: "Who's going to jump into bed with who next Friday morning." He said he was not interested in joining a coalition and getting a ministerial car or job, but wanted to "help drive the agenda" of the new government, particularly on an EU referendum. Mr Farage said he was not confident about Mr Cameron's pledge to hold an in/out referendum on UK membership of the EU by the end of 2017. "Mr Cameron once before promised a referendum, then he broke that promise, then he spent two years saying it wasn't in the national interest, then he saw UKIP spreading like a purple rash across the country and decided he would offer a referendum. "If he held that referendum on his own, without UKIP holding his feet to the fire, I am not confident that it would be a full, free and fair referendum. It's got to be full, free and fair. I've seen some really twisted referendums held all over Europe. "Both sides have to have spending limits, there needs to be an ombudsman to make sure that organisations like the BBC give both sides of the argument fair play and we also need to define who votes." Mr Farage laughed off Mr Cameron's call for former supporters who have switched to UKIP to vote Conservative on 7 May: "It's desperate Dave saying to those voters who have left him over the course of the last five years 'Please come home'. "They are not going back to a guy that's covered the country in windmills, slashed our armed forces, raised the level of our foreign aid budget, presided over massive immigration and only at the last minute been persuaded to half-heartedly offer a referendum. "These voters are not going back. Most UKIP voters haven't come to us from the Conservatives, they are coming from Labour, a few from the Liberal Democrats and a huge chunk of our vote is from people who were completely outside the political process and see UKIP offering hope." He renewed his call for large-scale reform of the BBC, saying the corporation had "a role" as a public sector broadcaster and a global brand for Britain, but "I don't think it needs to do entertainment". He also warned about the impact that local news on the BBC website was having on local newspapers. Liberal Democrat leader Nick Clegg, on the same programme, refused to say whether he would agree to a coalition with the Conservatives if they insisted on holding an EU referendum, saying he wanted to focus on his party's red lines. Sat alongside Mr Farage at the end of the Andrew Marr Show, he also said that the Lib Dems would not go into government with UKIP. After Mr Farage said he would not go into coalition with anybody, but would do what he had to, to ensure there was an EU referendum, Mr Clegg joked: "You also want to take away Strictly Come Dancing and that's terrible - that's much more important than an EU referendum." 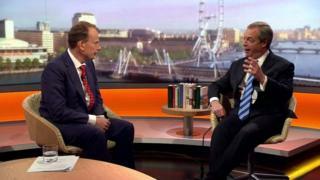 Mr Farage repeatedly said "no" as Mr Clegg made the quip. David Cameron says that the only way to ensure there is a referendum on the UK's membership of the European Union is to vote Conservative in Thursday's election. He has also said that, even if the Conservatives do not achieve an overall majority, he would not do a coalition deal with anyone unless they agreed to a referendum being held.